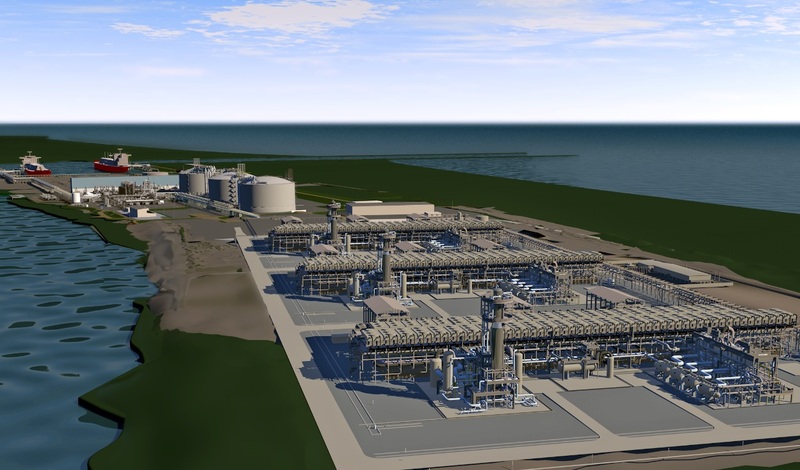 Image Courtesy Of Freeport LNG Development L.P.
Freeport LNG Development and FLNG Liquefaction 4 LLC have filed an application with the US Federal Energy Regulatory Commission (FERC) seeking authorization to site, construct, and operate additional natural gas liquefaction facilities at Freeport LNG Development’s existing Quintana Island Terminal in Brazoria County, Texas, USA, as well as associated pretreatment and pipeline facilities, for the purpose of liquefying domestic natural gas for export to foreign countries. The Train 4 Project will be constructed as an expansion of the Liquefaction Project currently under construction at the terminal. The Project will add a fourth liquefaction train (Train 4) to provide additional export capacity of a nominal 5.1 million tonnes per annum LNG. Pipeline-quality natural gas necessary for operation of the Train 4 Project will be derived from interconnecting pipeline systems (e.g., Dow Pipeline Company, Kinder Morgan Texas Pipeline LLC, Brazoria Interconnector Gas Pipeline LLC, and Gulf South Pipeline Company LP) and shipped to the terminal through Freeport LNG Development’s existing Stratton Ridge Meter Station and a proposed new 10.6-mi. (17-km) long, 42-in. (1066-mm) -diameter natural gas pipeline. The major project component to be constructed at the terminal is one propane pre-cooled mixed refrigerant train (Train 4), which will be identical to the liquefaction project’s three previously authorized liquefaction trains, along with ancillary support facilities and infrastructure. The proposed liquefaction facilities associated with the Train 4 Project will be located entirely within the footprint of the previously authorized terminal. The proposed facilities at the terminal includes a propane pre-cooled mixed refrigerant LNG train with multi-stage electric-driven mixed refrigerant and propane compressors. Freeport LNG anticipates being ready to commence construction of Train 4 by the end of 2018, with operations commencing as early as 2022. The initial three liquefaction trains of the Freeport Liquefaction Project are currently under construction, and are scheduled to commence operations sequentially between Q4 2018 and Q3 2019.